The HÅG Conventio Wing is a dynamic chair that is specially designed for meetings and conferences. The integrated rocking mechanism inspires movement and variation, improving the ability to stay alert and concentrated in long meetings. Constructed from lightweight materials that withstand heavy use, the wing or opened-book shape back gives the chair a fresh shape. The seat and back are manufactured from recycled automobile bumpers and plastic household waste bottles HÅG Conventio Wing is self-stabilizing on uneven ground and is never unstable when sitting. 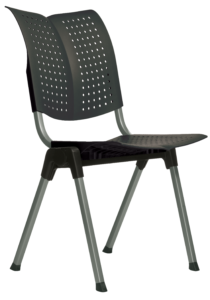 Simple maintenance makes the chair well suited as a general purpose chair for conferences, schools, universities, libraries, canteens, cafés and hotels. HÅG products are distributed by ergoCentric in North America.